I would recommence the incomplete field studies of tree frogs of the Litoria ewingii complex with concentration on mapping the zones of contact between the component taxa and on the analysis of the nature of the interactions between them using a battery of techniques – acoustic, morphological and molecular. In this way, I would hope to gain a clearer understanding of the structure and dynamics of hybrid zones and of critical stages in the processes of speciation. I was supervised by A.R. (Bert) Main at the University of Western Australia, firstly for BSc (Honors) (1954) and then for PhD (1955-57). Bert introduced me to the challenges of evolutionary biology, and I became thoroughly absorbed into this topic. Because of my interest in electronics, he encouraged me to get involved in the then newly emerging technology of acoustic recording in the field and the associated objective laboratory analysis (both now within bioacoustics). I have continued with this interest in that mode of communication throughout my subsequent research career and have applied the technology to questions of mate choice in speciation and the evolution of acoustic signals. Which paper of yours is your favourite? This is a difficult decision to make; but I have settled on the following work because it gave me the first real opportunity to attempt a synthesis of some significant stages in the speciation process, and to attempt an appraisal of the concept of species. Littlejohn, M. J. (1981). Reproductive isolation: a critical review. In: W. R. Atchley and D. S. Woodruff (eds), Evolution and Speciation. Essays in Honor of M. J. D. White. Cambridge University Press, Cambridge. Pages 298-334. There is a problem in answering this question because of the natural reaction to suppress such a traumatic experience deep in the mind and under thick layers of scar tissue. But the other day, I inadvertently came across a letter from the editor of an evolutionary journal with the attached reports of two referees (all shall remain anonymous). The co-authored paper dealt with the structure of the advertisement call of a south-eastern Australian species of tree frog some 111 years after it had been introduced into an island system that was a virtual frog vacuum. We had seen this well-documented introduction and the quantitative comparison of call structure, as providing a significant aspect of speciation in frogs. But this view was not shared by the referees who considered it to be a rather localized, minor and taxonomically restricted case; and both recommended that the paper be resubmitted to a herpetological journal – which we then did (and it was published). There can be no doubt that the signal work of George Williams on “Adaptation and Natural Selection” (1966, Princeton University Press, Princeton) had the greatest impact on my understanding in this area, for it dragged me out of a completely uncritical approach to the relevance of “group-selectionist” thinking, and into the purity and truth of seeing the individual as the unit of selection. Ronald Fisher would be a runner-up for me, with his profound thoughts in the non-mathematical parts (especially Chapter 6) of “The Genetical Theory of Natural Selection” (1958 second revised edition; Dover, New York; of original 1930 version published by Oxford University Press. Oxford). As you may gather from the above comment, I was unable to accept the approach of Richard Dawkins to the isolated selfish gene as being directly amenable to selection; so I did not receive any really significant inspiration from him. This concept thus tended to turn me off reading his other general works. I have found the several collections of essays of Stephen Jay Gould which I have read to be interesting, entertaining and light reading; I but have never attempted to read any of his major works. So at this stage, I do not have a preference for either author. If you had the opportunity to ask Charles Darwin one question, what would it be? As an octogenarian, I am far too old to recall my really early memories. One possibility is the trauma associated with walking into the path of a fast moving bicycle when I was about five years old (maybe). I received superficial lacerations to my neck (probably due to penetrating between the spokes) and a badly grazed knee. I cannot recall what happened to the rider – who presumably went hurtling off into quasi-oblivion, but he also survived, I guess. What was the last film that you saw? My wife Patsy and I recently saw “Quartet” – a cameo from life in a residential establishment for retired musicians (directed by Dustin Hoffman and with an excellent cast, including Billy Connolly and Maggie Smith) – which for us with our ancient and senescent phenomes* was most enjoyable and appropriate. There could be no winner in this hypothetical engagement. Because of their contrasting behaviours (e.g., nocturnal versus diurnal) they should never meet; and if they ever did, then their different but complementary anatomical features (e.g., longer beak versus shorter quills) would not allow direct physical engagement. I prefer white wine, – preferably a fine riesling from the Clare Valley. Tell us a secret that your colleagues don’t know about you. I am pretty much like a published version of an edited open book, and devoid of any secrets that could be revealed in this situation. The only possibility that I can offer is my enduring interest in the technical and social history of the railway systems of the United Kingdom and the United States; and the works of my favourite hero – the famous engineer Isambard K. Brunel. A doyen of Australasian evolutionary biology, Murray Littlejohn has spent almost 60 years (54 of them at the University of Melbourne) researching auditory communication in frogs with particular relation to the evolution of signal structure. 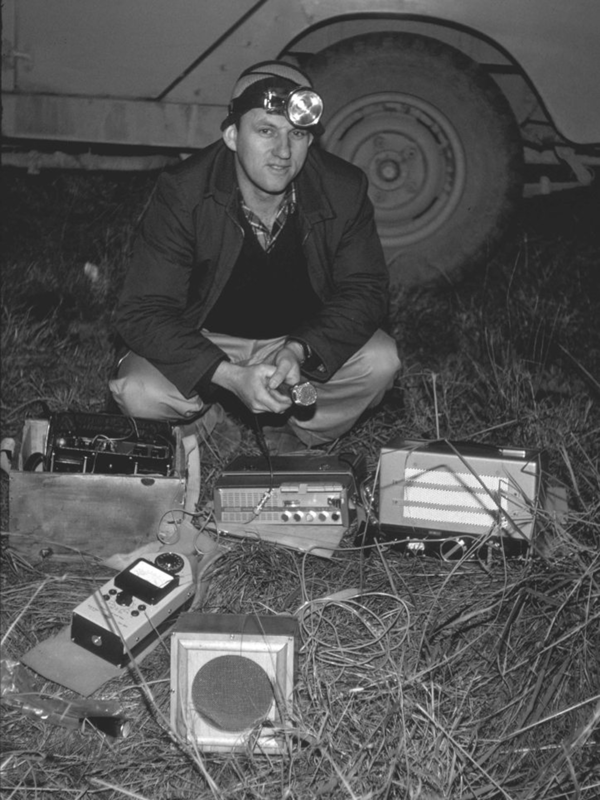 One of the pioneers of using audio recording equipment in biological field work, in 2010 Murray was awarded an ASRA (Australian Sound Recording Association) Award for Excellence for his lifetime’s work on sound communication in animals. A former president of the World Herpetological Congress and vice-president of the Society for the Study of Evolution, and now in his eighties, Murray continues to be research active and an inspiration to research students and staff at Melbourne University and beyond.